Schengen countries and EU countries are both European countries. Schengen countries are those European countries which have signed the Schengen Agreement which was signed in 1985 in Luxembourg in the town named Schengen. These countries operate as a single state with no border controls required when traveling within the countries but have the same international border control rules. EU countries are those European countries which are a part of the European Union and have signed the treaties of the European Union. EU countries have to maintain their own national military and foreign policies but are bound to judicial and legislative institutions of the EU. Currently there are 26 states which comprise the Schengen Area. Out of these 26, only 4 are not members of the EU. These four countries are: Iceland, Norway, Switzerland, and Liechtenstein. Norway and Iceland are members of the Nordic Passport Union. Many microstates are also included in the Schengen Area. These microstates maintain semi-open or open borders with the other Schengen countries. Two of these countries are the United Kingdom and Ireland. They are both members of the EU countries and still continue to have border controls with other countries of the EU. They are also referred to as opt-out countries. There are three de facto European microstates which are also included in the Schengen Area; Monaco, Vatican City, and San Marino. For a country to implement the Schengen rules, the country or state needs to have four areas assessed: air borders, police cooperation, personal data protection, and visas. In 1999, the European Union law absorbed the Schengen rules as per the Amsterdam Treaty. 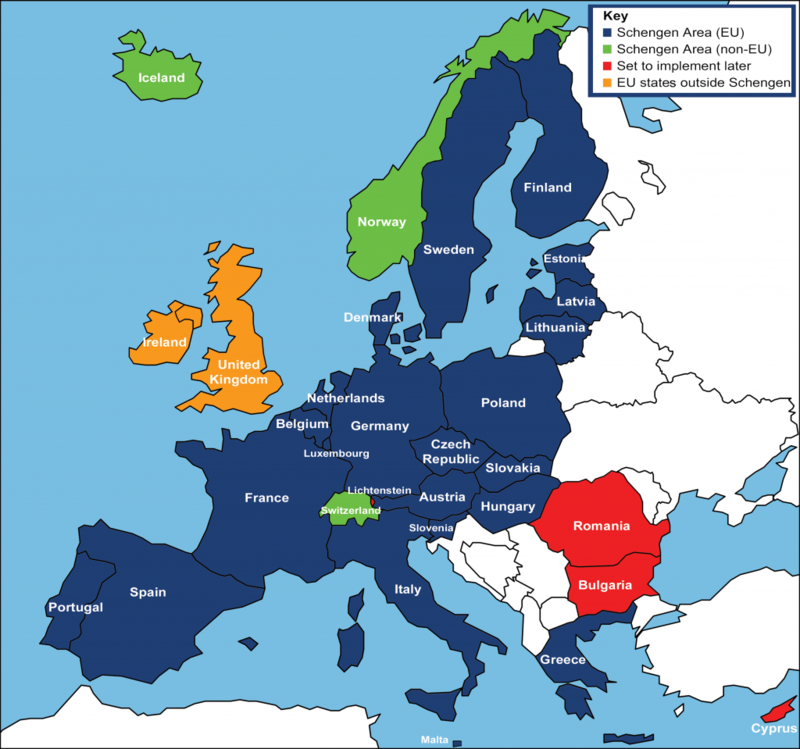 All the EU member states have complied with the Schengen rules except for Bulgaria, Romania, and Cyprus. The Schengen Area currently includes a population of 400 million people. Currently there are 27 European Union member states. In 1957, 6 core states, namely; Belgium, France, West Germany, Italy, Luxembourg, and the Netherlands founded the European Economic Community which is considered the predecessor of the EU. In 1993, the Maastricht Treaty established the current EU. In 2009, the Treaty of Lisbon has made the latest amendment to the EU’s Constitutional basis. For a state to join the EU, a state has to fulfill the political conditions and economic conditions known as the Copenhagen criteria. The Copenhagen criteria needs to have a democratic government and a free market government. All the states in the EU have equal rights; though there is a disparity in the wealth, political systems, and size of the states. It currently has a population of over 500 million people. Schengen countries are those European countries which have signed the Schengen Agreement in 1985 in Schengen, Luxembourg; EU countries are those European countries which are a part of the European Union, countries which have signed the Maastricht Treaty in 1993. Schengen countries operate as a single state with no border controls required when traveling within the countries but have the same international border control rules; for a state to join the EU, a state has to fulfill the political conditions and economic conditions known as the Copenhagen criteria. Nimisha Kaushik. "Difference Between Schengen Countries and EU Countries." DifferenceBetween.net. October 9, 2014 < http://www.differencebetween.net/miscellaneous/politics/differences-between-schengen-countries-and-eu-countries/ >.